Advanced DVD rental software for video game rental stores. 4POSRental maintains customers, inventory and rental / sales information. 4POSRental features include member image, email reports and overdues, sales taxes, reservations and reports and Code 39 and UPC-A barcode printing. 4POSRental uses a robust custom C++ database engine. Includes free live website inventory utility. Unicode compliant. 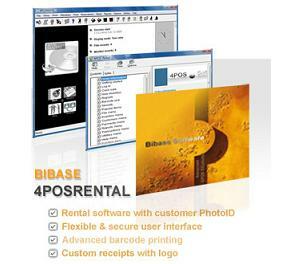 4POSRental is DVD rental software with PhotoID cards and barcode printing. ...... Reports offer daily summaries, overdue and multicopy analysis. An acclaimed and powerful interface with the minimum of 'screen swapping' making it fast and effective. Written in the leading C++ language it has comprehensive keyboard shortcuts for most operations. Qweas is providing links to 4POSRental 324.00 as a courtesy, and makes no representations regarding 4POSRental or any other applications or any information related thereto. Any questions, complaints or claims regarding this application 4POSRental 324.00 must be directed to the appropriate software vendor. You may click the publisher link of 4POSRental on the top of this page to get more details about the vendor.